Andrew Cuomo gets the official nod to become the Democratic nominee for New York State Governor…..
And 40% above his nearest challenger…..
Not a bad way to move towards your Dad’s old job…..
Mr. Cuomo’s appearance at the convention capped his crowning as the party’s nominee that has been in the making for the last year, as Gov. David A. Paterson had faltered to the point that he did not even attend the speech. His speech was received with sustained applause at points, if not exuberance, perhaps underscoring his arm’s length approach to some elements of his own party. He came closest to recalling the rhetorical flourishes of his father when he spoke of social justice. “We have to remember what is at the soul of the Democratic party,” he said, his voice rising. “You can go to schools on one side of town, and they will take you to first graders who are on the Internet, and you can go to the other side of town, and they don’t even have a basketball net,” he said, adding that the most impressive piece of technology at some schools was the metal detector. 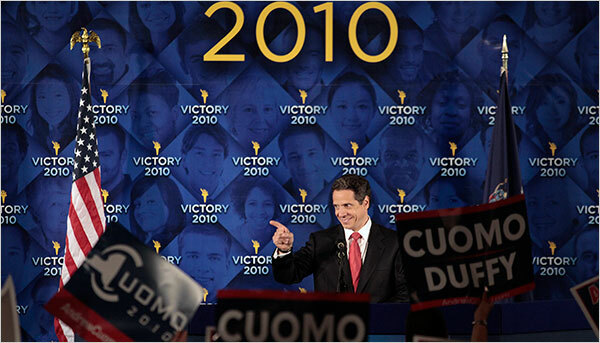 Mr. Cuomo’s was introduced by William C. Thompson Jr., the former New York City comptroller; Kathy Hochul, the Erie County clerk; and Vivian Viloria-Fisher, a Dominican-born Suffolk County legislator — an African-American, an upstate woman and a Latina, respectively. There have been grumblings from some Democrats that the party is putting forth a slate of candidates that fails to reflect the diversity of the state. Mr. Thompson’s comments echoed those of Mr. Cuomo.